Among the dance notations published in London in the early years of the 18th century there are several intended for performance by a girl. The majority of these choreographies are minuets. I have written about the minuets elsewhere, but I will return to them in a later post. I am currently reconstructing La Cybelline, a dance I haven’t worked on before. This gavotte, described on its title page as ‘A New Dance for a Girl’, was published in 1719. Although the composer of the music is named as the dancing master Charles Fairbank, the dance itself is anonymous. 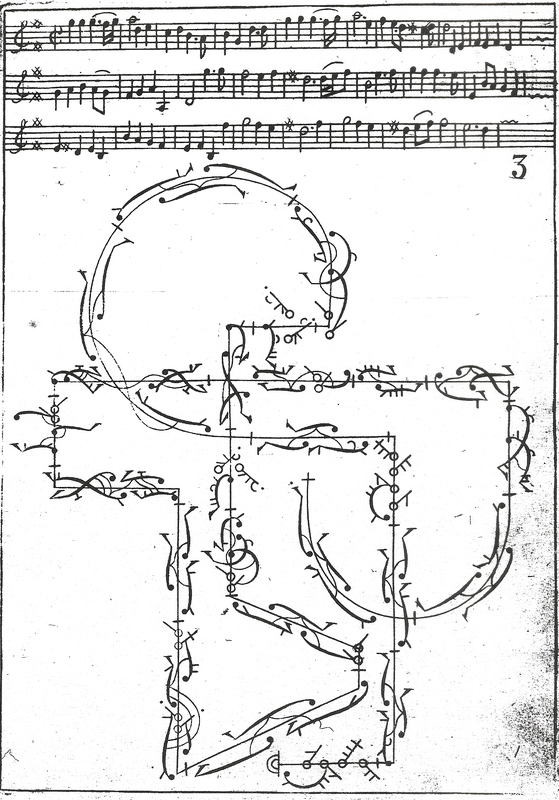 It is the only dance published in notation in London with no choreographer named. The only other dance with music by Fairbank is also a ‘New Dance for a Girl’, Mr Caverley’s Slow Minuet. 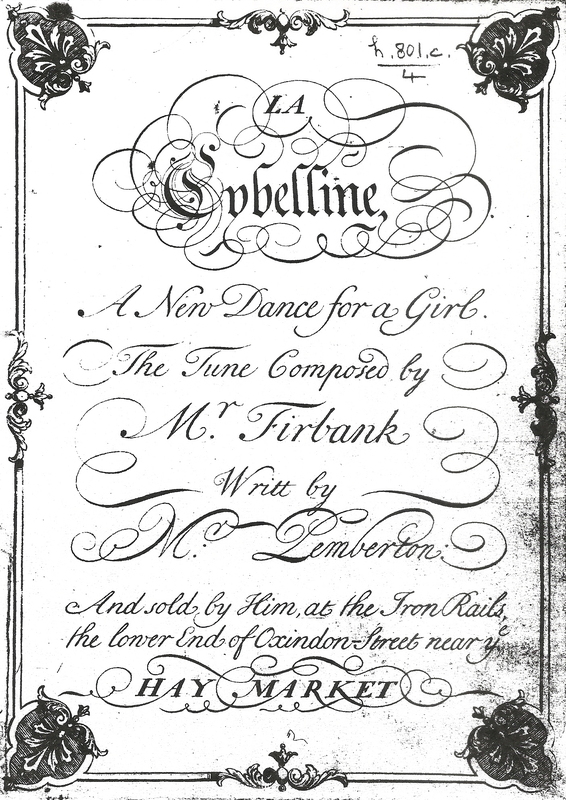 Both were published by Edmund Pemberton, who provided them with a specially designed title page as if he envisaged a series of ‘Fairbank’ dances. Like Caverley’s Slow Minuet, La Cybelline has the hallmarks of a piece designed to teach the refinements of belle danse style and technique for the ballroom. Who could have created the choreography? La Cybelline (1719). Title page. On the page, La Cybelline looks deceptively easy. More than half of its steps are versions of the ubiquitous pas de bourée. In fact, I’ve been finding it quite difficult to learn and I wondered why. An obvious source of problems is the delayed transfer of weight (known colloquially as a ‘foot fiddle’). There are five pas composés ending in a ‘point’, so that the final step is not completed. This allows the following step to begin on the ‘wrong’ foot, affecting steps and step sequences later in the choreography. It has taken several tries to break the ingrained habit of completing these pas composés in the conventional way. My difficulties went beyond the foot fiddles, so I did some more detailed analysis of La Cybelline. The music has the structure ABAB (A has 25 bars and B has 15). I don’t read music, so I couldn’t do a proper analysis, but repeated listening to the recording I am using suggested a phrase structure for each section. I then tried to divide the choreography into dance phrases – a process which is rather subjective and not easy. It appears to me that the dance phrases do not coincide with the music phrases, in fact the former cross the latter in a number of places. This is probably another reason why this dance is a struggle to learn. I also tried to divide La Cybelline into its successive figures. Comparison with the dance and music phrases suggests that the figures occasionally cross both the others, compounding the confusion. I won’t explain any further. So, the end of the first B is very similar to the end of the first A. The sequence which puts pas de sissonne with pas de bourée changes the order of the steps when it is repeated. I found the transition between the end of the first B and the beginning of the second A the hardest to remember – although this may also have been because they come on consecutive plates, and I was learning the dance plate by plate. La Cybelline. Plate 3, with the last of the pas de sissonne sequences. All these small challenges seem to have been included in La Cybelline deliberately, as a way of developing the young dancer’s technical control, particularly her aplomb, and her musicality. I’ll see what happens with the dance as the steps become more secure and begin to flow. There is also the question of style, from the varying dynamics of the steps to arm movements and the use of épaulement. How would an 18th-century girl have performed a little showpiece like La Cybelline? This entry was posted in Ballroom Dancing, Dance Treatises & Notations, Steps & Figures and tagged Baroque Dance, Charles Fairbank, Edmund Pemberton, Gavotte on June 4, 2015 by moiragoff.